The immersive world that a VR game can create, gives way to the body having full range movement while playing. Arms can swing while the player is wielding a sword. The body can jump back and forth while dodging attacks. This movement can exhaust a player over time and deliver a pretty good workout. Aaron Stanton, the founder, and director of the VR Health Institute has made it his mission to prove that certain VR games can be beneficial to your health. I sat down with him to find out just what it takes to gather this data and what makes a good VR fitness game. VRFI: Tell me a little bit about your background? Aaron: My background is entrepreneurial. I started a company back in 2006 called BookLamp. It was a technology-based book analysis platform. I ended up selling that company to Apple in 2014. After the sale, I came down to the bay area and worked for Apple as an iBook Project Marketing Manager and was there for several years. VRFI: When did you get interested in Virtual Reality? Aaron: I have been interested in Virtual Reality since I learned about it. Back when the original Kickstarter for Oculus Rift was happening, I had no money to buy the system, but I was very enthusiastic and would read up on it whenever I could. 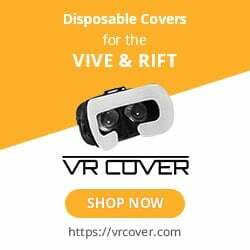 After I was in a position and had more substance in my finances, I jumped into the VR world and started exploring the different headsets and games that were available at the time. VRFI: When did you realize that certain VR games could give you a workout? Aaron: One of my favorite games on the Vive is called Audioshield. One day I was looking at my SteamVR account and noticed that I had played over 130 hours of Audioshield. That is a lot of time playing a game. I started thinking about the fact that during game play, I was burning calories and from the way I felt, it was probably a lot. That would make my VR system the most efficient piece of exercise equipment I have ever owned. I’ve had a treadmill and a rowing machine, and I guarantee you I’ve never spent 100 hours on any of them. VRFI: How did you go from playing games to doing game reviews for fitness? After realizing how much time I spent playing Audioshield, I started getting curious on how I could measure the effectiveness of these games when it came to fitness. I ended up buying a heart rate monitor and started collecting heart rate data in different games. Somewhere along the line, I posted an article where I sorted the games, from highest to lowest with the heart rate data. The article started to get some buzz, and I noticed that a good amount of the responses were skeptical. Some of the comments were “I bet his heart rate was artificially exaggerated because he was scared of something in the game.” Another one was “maybe he had a lot of caffeine before he played.” All these comments were leaning towards why you couldn’t get a high heart rate playing games in VR. On the one hand, if you never played in VR,.. fair enough, but me having played in VR and knowing what I was feeling, I had no such concerns. What I needed to do, was to figure out a way to sit down and validate the calories I’d burned and that I was making long-term positive changes. VRFI: Why do you think there were so many negative comments from your article? Video games are facing a 20-year stereotype that games are for lazy people. I was in London a few months ago and saw a poster. The poster was an announcement from the Britsh Heart Foundation. It had a kid about seven years old, and he is sitting on a couch with a game controller in his hand. The title of it said “Risk An Early Death, Just Do Nothing” The message of this poster was basically saying, If you want to be healthy and don’t want to die young, don’t play games. This is the same messages we are seeing in the US as well. The Center for Disease Control has data that shows the average video game player in America plays six hours or more video games a week. More interesting than that, is that 35% or so of high school students report playing more than three hours per day of video games after school. The Center for Disease Control identified this in one of their studies back in 2014 as one of the major risk factors of being unhealthy. They measured video game usage as a direct contributor to being overweight or unhealthy. On the one hand, those are amazing stats because it shows how influential video games are. People are playing games a lot. It’s one of the most persistent past times we have in the country, and yet, it’s so powerful that it’s gotten on this unhealthy watch list and has been deemed an epidemic because of its negative effects. Question is though, can VR games change that all around? Suddenly it goes from a force against being healthy to an advocate for it. VRFI: How did the VR Health Institute get started? I started researching how people measure calorie burn for new and unusual exercises. I found out you do that by using a method called metabolic testing (MET score). This type of testing will give the most accurate results. The hardware for this testing is relatively expensive, so I started asking around at universities that had this kind of equipment. I connected with San Francisco State University and Dr. Kern and her team. I went in and gave them a pitch on how I thought that VR and exercise was a future yet to be born and whoever started studying it now would have a lot of credibility into what this future looks like. They were interested, and we partnered up together and created the VR Health Institue. They gave me access to equipment and their labs, and I supplied some testing equipment also. We built out the process and methods of testing and started rating games. VRFI: Tell me about the game reviews and your process? We have a multiple step process that we take to create our VR game ratings. We start with what we call Raters. Raters are people who come into the lab and work with us to calibrate the equipment. They wear a heart rate monitor and at the same time use the oxygen conversion so we can create a baseline for them. We have them go through different levels of a game and spend a good amount of time playing. We gather this preliminary data and decide which games give the best workouts. For games with a high potential for exercise, those will go through a second round of testing. That data is used for what we call the primary rating. The primary rating should be all that’s necessary for most games because it is calibrated and under controlled circumstances. This type of ratings we can do relatively quickly. The more formal oxygen O2 base ratings we do in batches and a little slower. We set up testing for every other week and test 4 or 5 games at a time. Once the testing is done, we gather the data and put it into the rating template where we show the duration of time spent testing and calories burned per minute. We also take the intensity of the exercise and measure it up to other activities, like biking, running or swimming. We do this so people can get a sense of how the game play stacks up to everyday activities. All of this information is rolled up into one easy to read game rating label. VRFI: With all the research you’ve done, do you have any advice for game developers on how to make a game that gives a better workout? Don’t stop the experience as a punishment for players. For example, let’s say you are playing a tennis game in VR and you are not good at tennis. Every time you miss the ball, the game has a delay in it, and it takes time to get the next ball queued up because the developer wanted to show a funny animation or something like that. A good fitness game will keep you moving so you have a maximum calorie burn. Another piece of advice is not to exhaust your player to fast. You don’t want the game to be so hard that the player gets exhausted after 30 minutes of game play. You want the game to have a consistent flow to it, so the player doesn’t want to stop playing after 30 minutes.